Kidrobot is celebrating its tenth anniversary in royal fashion. The collectible toy company is re-releasing the Gold King Dunny, a sought-after piece that was released in the very first Dunny Series back in 2004, as a special “thank you” to the fans that have followed the brand for the past decade. Tristan Eaton’s royal take on the figure is 8 inches of sleek metallic gold vinyl, leaving Dunny’s form unobstructed and pure. It boasts a golden crown on one ear and carries a scepter topped with black stone. 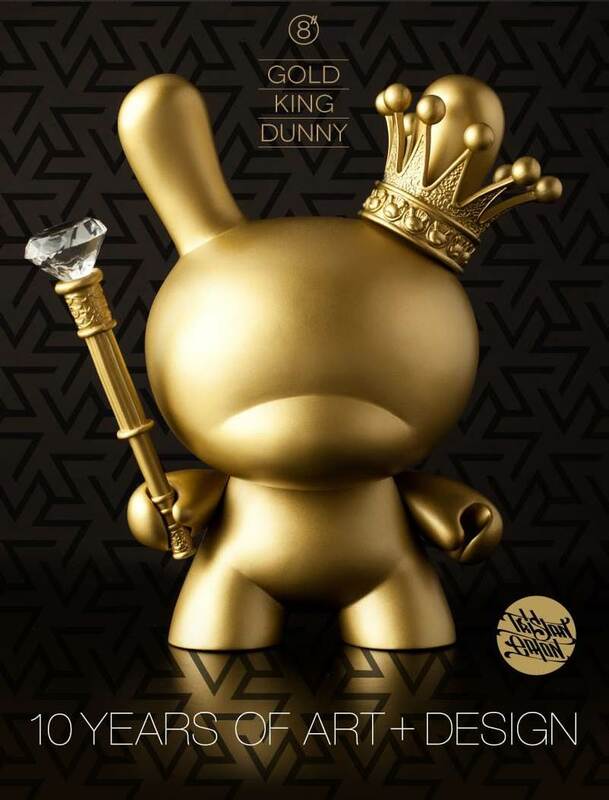 The Dunny Series stands as one of the most popular lines of vinyl collectible figurines today, having helped establish Kidrobot as a leader in the world of designer collectibles. The line is based around the Dunny, a curved bunny with a smooth face, that serves as a blank canvas for high-profile artists to reinterpret and repaint. As one of the 15 figures included in the popular first set of Dunny pieces, the majestic gold figure is the perfect way to celebrate the company’s ten illustrious years in business. Eaton is one of many high-profile artists that have collaborated on Kidrobot projects over the years. The Los Angeles-born street artist designed his first toy for Fisher Price at the age of 18 before becoming a driving force behind the “Designer Toy” movement. Eaton has also become a leader in the world of advertising, regularly consulting on projects with Hasbro, Pepsi, and Nike. His work can be seen at the Cooper Hewitt Museum and in the permanent collection of the New York Museum of Modern Art. The limited-edition Gold King Dunny 8-inch vinyl figure by Tristan Eaton will be available at the BAIT retail store in Diamond Bar, California, a lifestyle boutique that aims to bring the best of the sneaker, music, art, and collectible cultures together in one distinctive space. Check BAITme.com for more details.